Tá Liam Emmery imithe at shlí na fírinne le sé bliain anuas ach d’fhág sé a obra maestra don domhan ina dhiadh. I lár na coille, ní fheicfidh tú a chruthaigh sé ach i lár na coille atá sé. Seo an radharc ón spéir. Cailleadh Liam nuair a bhí timpiste aige is bhí deacrachtaí aige ina dhiaidh sin. Ach sular imigh sé uainn d’fhág sé bronntanas álainn dúinn. D’inis a bhean chéile, Norma, do dhaoine faoi na crainnte a chuir sé nuair a chonaic siadsan na híomhánna iontacha ón spéir. Bhí said curtha ag Liam chomh fada sin siar ó shin go raibh dearmad déanta aici ar a rinne sé. Ach ag éisteach leis na daoine ag caint faoi a chonaic siad bhí sí cinnte go mbeadh bród air faoin tortha ar a gcuid oibre a chuireann ionadh is áthas ar dhaoine. Saoi a bhí ann, do deimhin, a thuig go gcaithfimid áit a fheiceáil ó dhearcadh i bhfad i gcéin leis an áit a thuiscint i gceart. Iontach gur féidir linn bheith i bpictúir álainn i ngan fhios dúinn féin is muid i lár na coille. Meafar curtha aige sa talamh blianta ó shin a d’fhás go mall is a léirigh a rún dóibh siúd a fheiceann níos mó sa chúlra ná daoine eile. Ealaíontóir a roghnaigh beothacht mar a mheáin. Who painted Lisa Gherardini (the Mona Lisa)? Was it Leonardo Da Vinci or was it his lover Andrea Salai? The answer depends on which one you are talking about. Look at the images above. 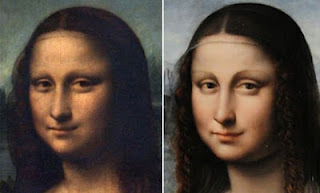 The Mona Lisa on the left above was painted by Da Vinci and the Mona Lisa on the right was painted by his lover, Andrea Salai. Both were painted at the same time, are the same size, and are practically the same in detail. For far too long Salai’s Mona Lisa was misunderstood and hidden away but now its secrets have been revealed. 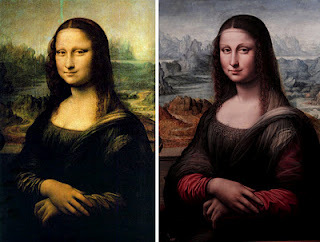 Art experts thought until very recently that Andrea Salai’s version of the iconic Mona Lisa was simply a smaller copy by some unknown Flemish painter. The painting had been covered in varnish and the bottom part of the painting was completely obscured. So it was ignored and cast aside. To the world at large both Andrea Salai and the twin painting are unknown. The twin Mona Lisa is still hidden away, buried in the basement of the Prado art museum in Madrid. As I plan to go there in April this article http://www.gonzalo-vazquez-vilar.eu/nota/ caught my eye. I was more than surprised. The Mona Lisa has a twin? Really? So, where is she and why don’t we know about her? Will I be able to see her when I visit the Prado? Sadly for me it is leaving Madrid. Lucky for you who plan to visit the Louvre, it is heading to Paris so the two paintings for a while can be viewed side by side before it comes back to the Prado.